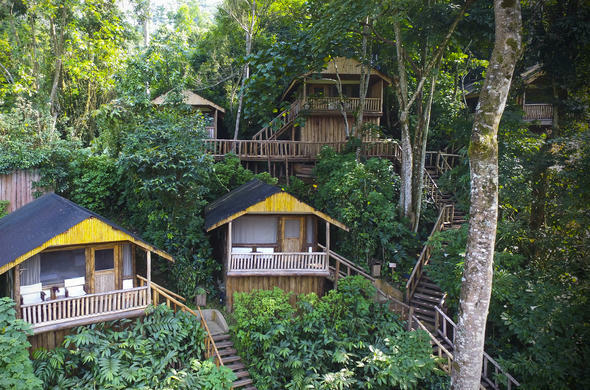 Guests at this Gorilla safari lodge in Uganda can enjoy top quality, intimate accommodation on the edge of the magnificent forest in Bwindi. This Gorilla safari lodge in Uganda commands spectacular and uninterrupted views of the Bwindi Impenetrable Forest National Park - home to the rare and elusive Mountain Gorilla. On occasion the Gorillas have even been seen in the garden! Completely renovated from the original homestead, Buhoma Lodge provides a warm welcome in a beautiful setting. The lodge has been designed with the environment in mind, making use of sustainable local materials and giving support to local communities and businesses. After an exciting day on a Gorilla Trek in the forest, guests return to hot showers and the comfort of Buhoma Lodge. The bar has a selection of local and imported drinks, and the friendly staff look forward to discussing visitor's daily adventures. As part of a commitment to the community, staff members are recruited locally and trained on site to provide excellent service to guests. Activities at Buhoma Lodge include Gorilla Trekking, forest walks, birding and cultural interaction. Hot beverages are available throughout the day on a self service basis, but also delivered personally with a wake-up call as required, allowing guests to awake gently and savour the early morning forest sounds.